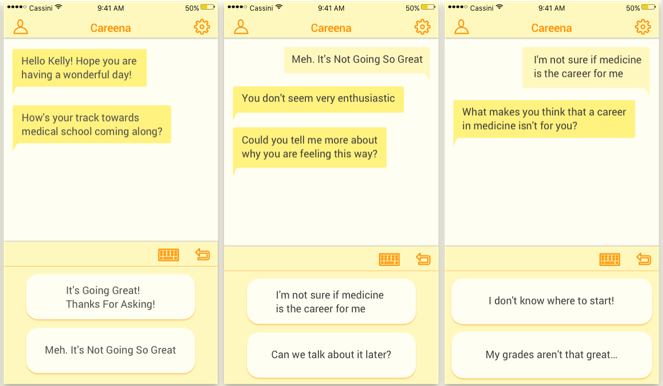 Careena is a career guidance chatbot our team designed with the purpose of providing career advice and suggestions for first year pre-med students. We applied user research, affinity mapping, conversation mapping, and prototyping for this project. ​Making the right career choice can be a source of anxiety for a lot college students early on. 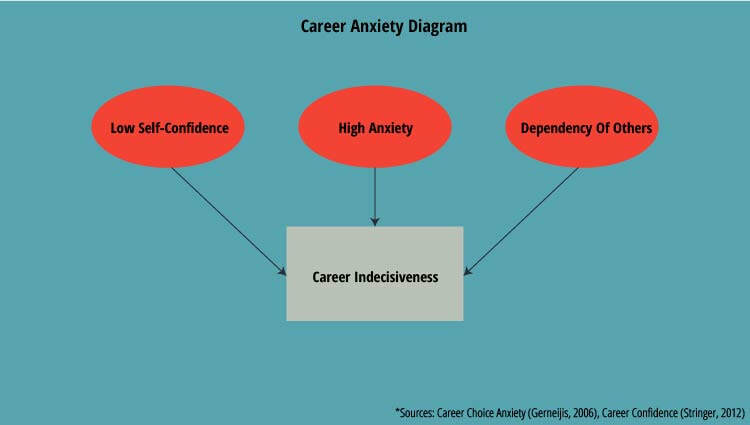 A common theme we found within the research papers on the psychology of career decision making was that career indecisiveness was linked by three factors: low self-confidence, high anxiety, and the dependency of others. This is especially the case for many first year students who are on the pre-med track with intentions of going to medical school and becoming a doctor. 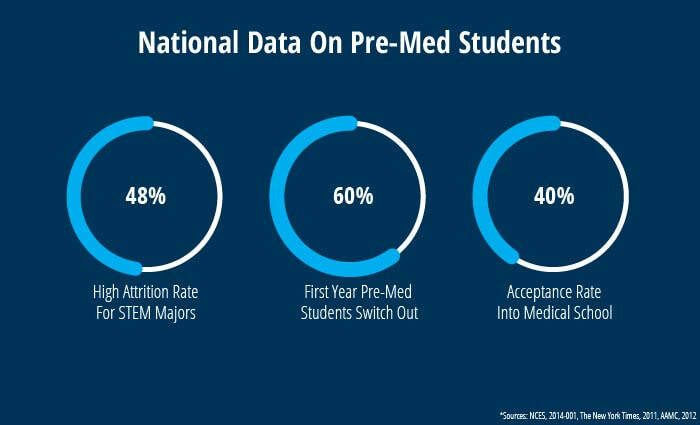 The data below suggests that the track to getting into medical school is one that is very rigorous and competitive with no guarantee of getting accepted the first time around. How can we help mitigate the pains of career decision making for first year pre-med students? Once we had a general understanding of the scope of the problem, our first step was conducting discovery interviews with the freshman pre-med students. The reason behind conducting the user interviews was so that we could capture the behavioral nuances and sentiments for their motives behind pursuing the Pre-Med track. What was your motivation for going the pre-med route? What are you currently doing to help with your pre-med trajectory? Whom do you consult for pre-med career advice? What kind of answers do you hope you to obtain? Recruitment via Facebook University Pre-Health Groups and Freshman Class Groups. Recruited 6 participants for the interviews. Interviews took place over 1 1/2 week period during specified times. 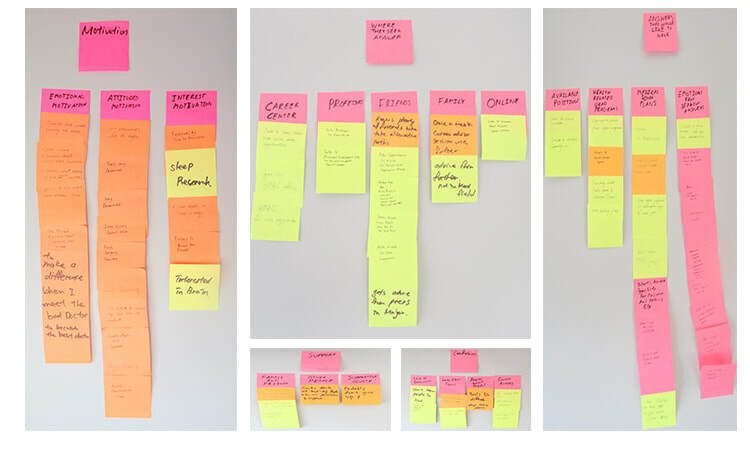 After we finished the interviews, we held an affinity mapping session to uncover insights from the raw qualitative data. As a result of the affinity mapping session, two personas began to emerge, helping us illustrate their stories better. These insights served as the basis for our approach to designing our solution. The current situation for seeking out advice involved going through multiple websites and talking to multiple people. This process was very exhausting for Kelly and Kevin who wanted absolute, straightforward answers to reaching their goals. "What if Kelly and Kevin were able to consult just one person with all the best advice they needed, whenever convenient?" That's when we decided to explore the concept of a conversational UI, where the user would interact with an intelligent chatbot in an interface akin to an instant messenger. Since our app was about career advising, we decided to name the chatbot, Careena. Due to the scope of the project, we decided it was best to focus on one scenario for the final final prototype. 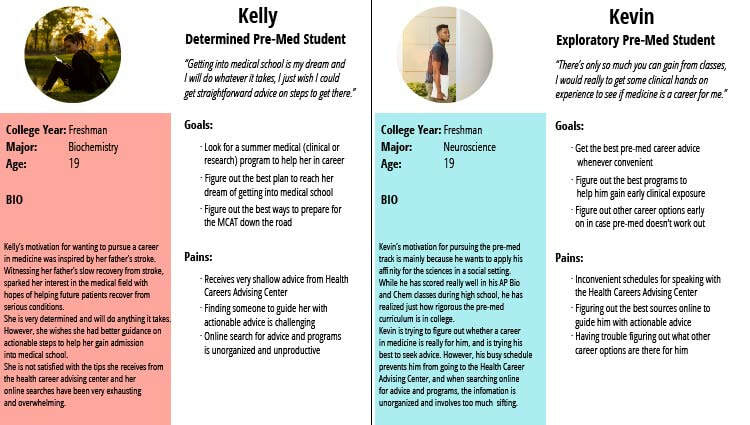 We decided to focus our tips around convincing Kevin and Kelly to consider shadowing for a clinic during their first summer. The biggest challenge was designing how the user would proceed through the conversations. To work around the limitations of AI, we designed a choice architecture that was akin to text-based adventure games, where the user would select an option within the conversation to proceed through a path. Working closely with our UX/UI Designer on the team, we iterated on the layout of the interface for Careena. Taking inspiration from other messenger apps and chatbot interfaces. ​When it was time to start creating the final version of the prototype with the scenario, to make it easier for my teammate, I created a sample sketch to illustrate how the interaction would work for guidance. How the colors made the users feel? Were they able to navigate through the chatbot scenarios? Acknowledgments: This project was conducted at The University of Texas at Dallas under faculty guidance by Cassini Nazir. This project was in collaboration with Derek Han and Yan Su. Visual UI Designs by Derek Han and photographs from interview by Yan Su.